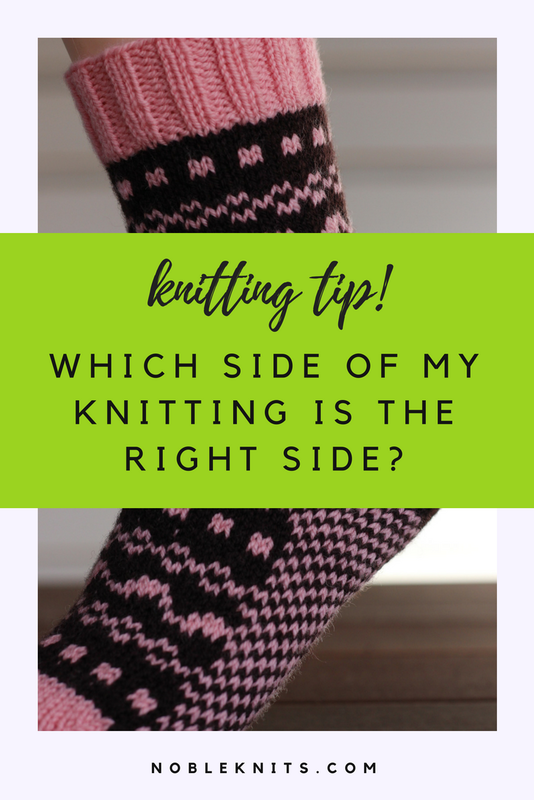 Which side of my knitting is the right side? the WS is the private side: the side of the work I want to hide, the "messy" side where I've woven in my ends. Sometimes, as in the case of colorwork like these above socks, the RS and WS are pretty obvious. We know which way to wear these socks. But what about things like shawls and scarves where both sides can be seen? Does the pattern name the stitch? Sometimes we get lucky and we know that a project is going to be worked in flat stockinette (knit on the RS and purl on the WS), such as the Islamorada Shawl. When you look at the picture you can clearly see that the RS (or public side) is all those beautiful little "V"s of stockinette. The same can be said of working stockinette in the round (knitting all sts) like in the Simplicity Pullover - in the description of the project we're told it's worked in stockinette. But what if the project is reversible? In the case of some shawls, scarves, wraps - anything that can be worked flat where both sides can be seen - a pattern can be designed to be reversible. The most common fabric used for this is garter stitch: you knit on the RS and the WS of the project to get a nice squishy fabric such as in the Hitchhiker shawl. In this case, while the finished project can have both sides considered the public side, when working the project, it really does matter! One edge of the shawl has increases and the other end has decreases. You definitely don't want to mix them up! Row 1 (RS): K1, kfb, knit to end [1 st inc]. The second step is to grab your favorite locking/removable stitch marker and clip it to the fabric when you work that first RS row that you've highlighted. Clip the marker into a stitch you've just worked so that it's still facing you as you work to the end of the row. Now, each time you turn your work and see your little marker, you know the RS is facing you (see the below hat project - knit flat, I needed to know which side was the RS so I could work my shaping when I saw the marker).